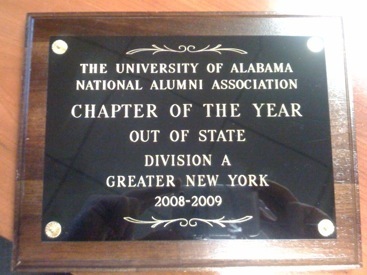 The Greater New York Chapter of the University of Alabama Alumni Association (UANYC) was named the 2008-09 Division A Out-of-State Alumni Chapter of the Year by the Alabama National Alumni Association. The award is given each year to the alumni chapter not based in the state of Alabama that excels in supporting the University’s mission and goals through scholarship support, community involvement, new member recruitment and chapter activities. This is the first time in over 15 years that UANYC has been honored with this distinction.